Juicy Peaches and Nectarines are one of my favorite fruits in the summer. Nothing beats biting into a juicy peach and letting all the juices run down your chin as you savour the sweet nectar.Some of my favorite recipes with peaches are upside down peach cake, peach sorbet, peach bellinis and even peach and mint salad. 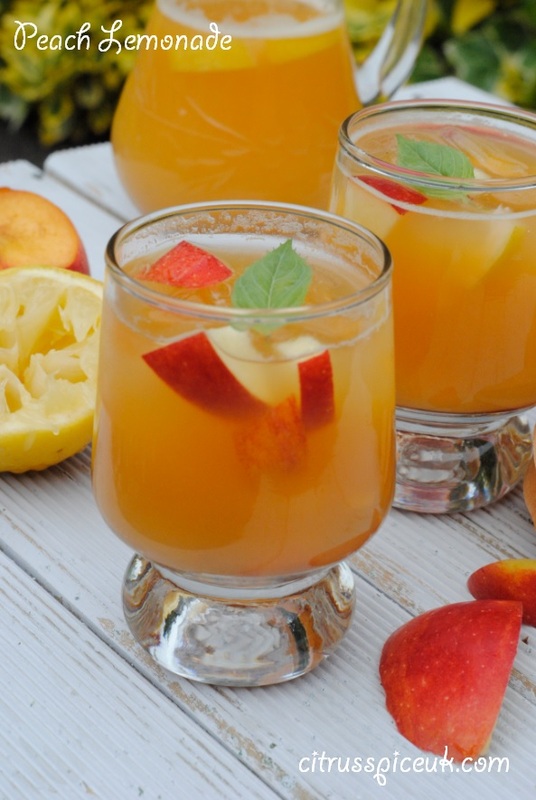 But one recipe that is most popular in our household is peach lemonade. Not only is it refreshing but it is high in vitamin C with no added sugar. 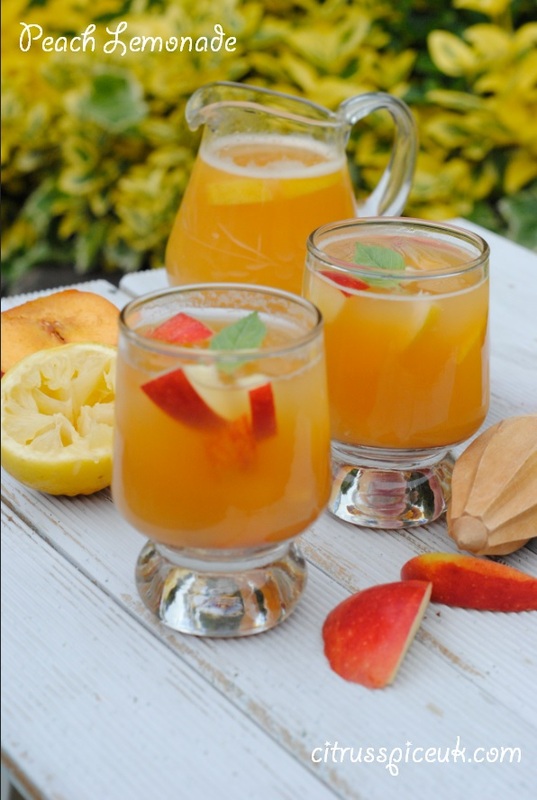 Refreshing and fragrant peach lemonade with a citrus kick. 1. Wash the peaches, cut them in half and stone them.2. Cut one of the peaches into slices and reserve it for garnish. 3. Peel the lemons and remove the skin and pith.4.Add all the peach halves and whole peeled lemon into the Optimum 600 and extract the juice, once all the fruit has been juiced add some stevia sugar to sweeten it. 5. 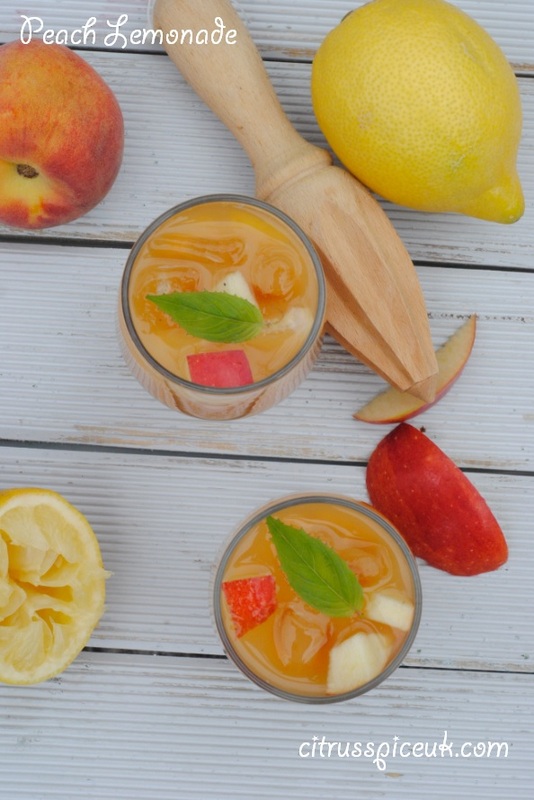 Strain the juice into a jug and add the sparkling water, ice cubes, peaches slices and mint leaves 6. Stir and serve in tall. the juicer is currently on sale. To get the Summer Sale Special price of £279, Key Coupon 50SUN At Check Out To Receive £50 Off. This looks like a perfect summer drink, mmmmm de-lish! This looks absolutely delicious and so refreshing! What a wonderful combination of flavours. This looks and sounds delish! Have pinned to make during the summer hols! I am literally thirsty for peach lemonade now! What a great summer drink! I love peaches too, very summery. We make juices every day so I will try this one out. So refreshing and I love the colour too.. The pics are nicely shot in outside location. I love peaches but have never tried peach lemonade so am looking forward to trying this in my juicer. Seriously amazing looking! My boys will be nagging me to make some now! I love peach drinks too - I think a Bellini is my favourite cocktail. This sounds lovely. I do love peaches and nectarines, this sounds and looks delicious, I will have to give it a go! For quite some time, Arbor- Nomics Tree Support is a Greatest Pick within the Atlanta tree service group. That sounds great;) I shall expect an invite round to try some!!! Oh I love the look of this, think we would love it in our household! Oh wow, we have peaches that I passed their best and I have been wondering what to do with them. I am off now to make this! I love your drinks posts Nayna, they always looks so inviting and I bet this tastes as delicious as all the rest. I love peaches. This looks and sounds yummy. Looks so tasty! I've never tried peach lemonade but I think I'll have to now! I love peaches and so peach lemonade sounds (and looks) amazing. The peach and mint salad that you mention in your post also sounds yummy. Is there a recipe for that in one of your previous posts? I love peaches and so your peach lemonade sounds (and looks) great! The peach and mint salad that you mention in your post also sounds yummy. Is there a recipe for it in one of your previous posts? I'm normally a peach iced tea girl, but this sounds fantastic. Peach and mint go together so well. What a great idea & recipe. Oh my goodness this sounds amazing! I must try it! This looks so delicious, am I being really stupid though, I can't see the recipe in the post?! The photos look amazing! 1. Wash the peaches, cut them in half and stone them. 2. Cut one of the peaches into slices and reserve it for garnish. 3. Peel the lemons and remove the skin and pith. 4.Add all the peach halves and whole peeled lemon into the Optimum 600 and extract the juice, once all the fruit has been juiced add some stevia sugar to sweeten it. 6. Stir and serve in tall. Sounds a very refreshing drink. This looks absolutely wonderful, although summer is over! 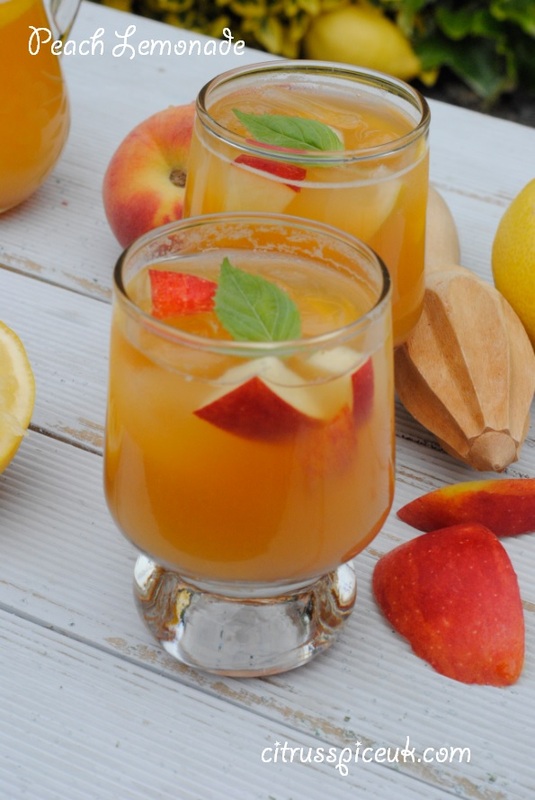 This looks gorgeous...I've not thought of peaches in lemonade before! This would go down so well in my house :) Totally bookmarking this for summertime - thanks!